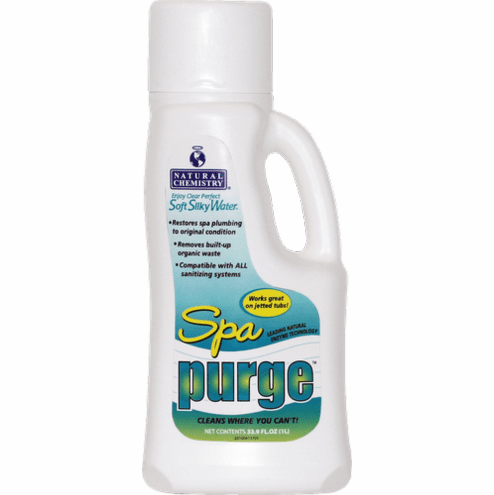 This spa chemical attacks the root cause of most spa maintenance problems -- the build-up of organic waste! Oils, lotions, cosmetics and sweat concentrate in your spa water and plumbing, producing scum lines, clogged filters, odors and foaming. Purging your spa of this organic waste will drastically reduce or even eliminate these symptoms. With spa water temperature at 95ºF or higher and circulation running, add entire contents of bottle to spa water. Run jets for a minimum of 5 minutes. Note: If foaming becomes excessive, turn jets off. Some foaming is expected during the purge process. Maintain water temperature at 95ºF and allow spa to circulate overnight with jets off. Drain and rinse/clean out the surfaces of the spa. Refill the spa water and reinstall the filter elements. Fill tub with hot water 1" above the jets. Add 1/2 bottle of Spa Purge. Turn jets on for 5 minutes (some foaming will occur). Turn jets off and let sit for at least 5 hours. Turn jets on to flush the system. Drain tub & clean surface as needed.